EWS500AP | Hypernet Solutions, Inc. Traditional APs deployed in the hallways of hotels, dorms and multi-tenant dwellings don’t always provide individual rooms with the level of connectivity demanded by today’s users. RF-blocking walls, and doors can make providing high-speed Internet access challenging and expensive in these environments. The Wall Plate AP is designed for quick, discrete in-room installation directly onto an existing electrical or data junction box utilizing existing in-room CAT5/6 wall cabling. Installs easily in minutes, eliminating time consuming planning and additional wire-runs while supporting lower wireless implementation costs for hotel guest rooms, student residences, retirement facilities, multi-tenant dwellings and classrooms. Integrated 802.11n Access Point & 4-Port Switch provides in-room wireless, Power-over-Ethernet and wired connectivity in a single, high performance device. Connect IPTVs, networked minibars, printers or game consoles via its 10/100Mbps ports; phone/fax machines via the passive RJ45 port and link/power VoIP phones through its PoE port. Power the AP via an 802.3af/at-compliant PoE switch or a separate DC48V power adapter. Deploy as a standalone wireless AP or part of a scalable Neutron WLAN Management Solution and managed via a WLAN Controller Switch or centrally managed via ezMaster Network Management Software. Together with Neutron Switches and Access Points, ezMaster is a flexible, highly scalable solution offering centralized network management with rich reporting and analytics, business-class features and no AP licensing or annual subscription fees. Deployed on a local or remote server – or in the Cloud*, ezMaster lowers total operating costs, speeding deployments and monitoring of a network with minimal IT assistance. Manage a few or 1,000+ APs and Switches on networks in different locations from a single location. Easily manage 10 or 10,000 concurrent users through a comprehensive at-a-glance network dashboard with rich analytics and reporting. 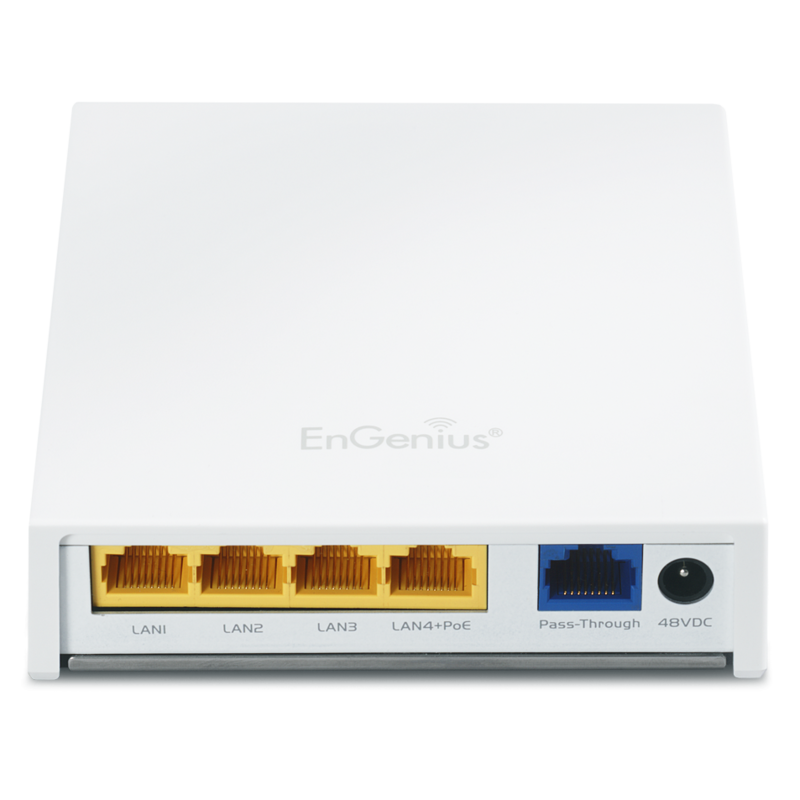 The EnGenius Neutron EWS500AP Wall Plate Access Point provides in-room wireless, Power-over-Ethernet (PoE) and wired connectivity in a single high performance device installed onto a standard junction box. It can function as a stand-alone Access Point or part of a scalable Network Wireless Network Management solution and managed via a WLAN Controller Switch or centrally managed by ezMaster™ Network Management Software. The AP is easy-to-deploy, lowering the cost of wireless implementation for hotel guest rooms, student residences, retirement facilities, multi-tenant dwellings and classrooms. Delivering high performance 2.4 GHz 802.11n wireless coverage with speeds to 300Mbps, an enhanced receive sensitivity MIMO and two (2) 4dBi internal antennas compliment its sleek low profile design ensuring it will not obstruct furniture placement as it blends with in-room décor. For wired connectivity, the AP features four (4) Ethernet downlink ports including, three (3) 10/100Mbps ports to support in-room connectivity for IPTVs, networked minibars, printers or game consoles. One (1) 10/100Mbps 802.3af-compliant PoE port for powering VoIP phones directly through the AP without additional cabling, switch ports or power sourcing equipment. An additional passive RJ45 pass-through port and 110 punch-down block is available for phone or fax machine connections. Neutron Managed Access Points can be deployed as a standalone wireless AP or part of a scalable Neutron Wireless Network Management Solution and managed via a WLAN Controller Switch or centrally managed via ezMaster Network Management Software. Together with Neutron Switches and Access Points, ezMaster is a flexible, highly scalable solution offering centralized network management with rich reporting and analytics, business-class features and no AP licensing or annual subscription fees.